Let me put you on the spot! Isn't native Iris versicolor pretty. Versi has loved the rain that has parked itself over my garden all spring and refuses to move. It's well established now, so it will make it through the droughts that will arrive in July! The other stunner in the garden is a tall nearly black bearded iris with a slightly sweet fragrance that already needs to be divided. Music to my ears with a flower this gorgeous! 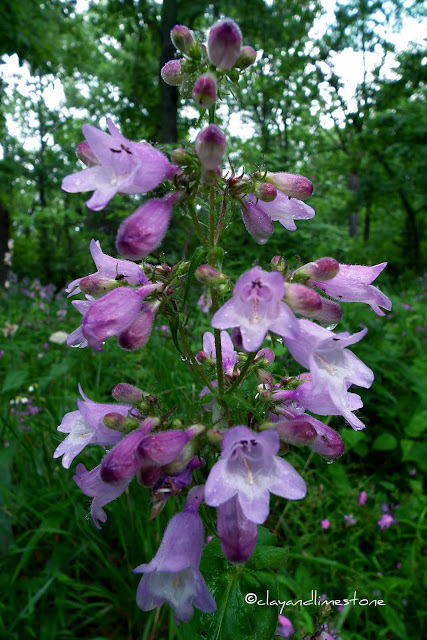 Penstemon X (P calycosus) continues to bloom everywhere. The noid peony was blooming earlier this month. It has the tiniest bit of fragrance, but the single bloom with the intense golden yellow stamens is what drew me from across the nursery to grab this plant clearly marked~'red peony'. Tell me the truth! Could you have resisted its charms? Spiderworts are blooming in full force~This is cultivar 'Sweet Kate' of the lime colored foliage. and who planted this pretty little flower? "Not I!" said the innocent gardener! But, it looks sweet among the rampaging pink Evening primroses. and the Lurie to find a Middle Tennessee native monarda that can take the dry soil that Clay and Limestone dishes out. I wish you all a marvelous week and a delightful May 2011 Bloom Day. Garden Bloggers' Bloom Day is brought to you by Carol, of May Dreams Gardens. Stop by her blog for links to blogs and blooms all over the known blogasphere. You're in for a treat~it's Spring (and Autumn in the Southern Hemphisphere) and gardens are dressed in their finest. All so lovely, and the monarda is especially sweet, reminding one of that great Chicago garden experience. But the highlight for me is the chalkboard of what's blooming, excellent! What a lovely display this month Gail. I like your image of white peony, it is such a beautiful macro, so clear and detailed. But I have to say that the Monarda is my favorite today. I have dry clay and limestone soil yet it does not put on a show like you have shown. In the Chicago field it is stunning. Your gardens are stunningly beautiful, I can't believe how many plants you have blooming now, you've definitely given me some ideas. I also have to thank you for highlighting the loveliness of Penstemon calycosus, after seeing it on your blog so often I just had to get some for myself, I found some online at Shooting Star Nursery. Your garden looks so inviting, I want to walk down that shady path. The peony is lovely - the simple white petals make such a great background for those stamens. I really like the spots on the Monarda. It's a really neat looking native. That was just a lovely tour. Thank you. I am so tempted to plant Cornflowers, love the meadows full of the blue blooms. I didn't lose any posts but lost comments and they are still gone. So many great blooms! I saw your lost post through Google reader but not on the blog itself. I had a post get lost by Blogger right around that same time. Frustrating! I really should replace my Monarda didyma with bradburiana. Can it resist powdery mildew? So many lovely blooms and so wonderfully photographed. I love that monarda...it looks very happy to have been found! My spiderwort foliage is barely emerging and to think yours is in full bloom. I'm glad you're supplying so much nectar for our pollinator friends because here we have less to choose from at the moment. What beauties in your garden Gail. I had forgotten about my Kate blooming. It likes where I have moved it. I like it too so I can see it more often. I love your chalkboard. A friend of mine has one at her house. I love to go to parties at her house. She writes greetings on it, menues for dinner,rules for games, prizes to be awarded etc. Such a handy thing. I love seeing what is in bloom here on it. FUN. Happy GBBD. I hate to mention that it says June on your blog. I bet you meant May. You must be having June thoughts. Rose, I haven't seen any powdery mildew on mine~and i live in a very humid part of the garden. Give it a try~gail also try planting an allium at its feet, I've read that helps monarda fight pw. I am in love with those dark irises. I must put them on my list. Loved that shot of the monarda against the Chicago skyline. What a pretty monard it is! So cheerful - love the 'noid' flowers - I'll have to use that monniker for many of my plants as well! The rampaging primrose is beautiful. I'm loving all of the blues and purples. Is the Sweet Kate spiderwort as aggressive as the regular one? Gail, I love your noid peony. It reminds me of my Matilija Poppy! Oh, that Iris germanica! I'm still swooning! What a profusion of blooms! My Monarda in the herb garden isn't blooming yet (I can hear the bumble bees tapping their feet as they impatiently wait for it). I love your Monarda bradburiana though. It has a slightly more wild and relaxed look about it. Lovely blooms! I see a nigella, such a dainty blue, found its way to your garden...if I didn't send you seeds from last year, I can this year. Absolutely beautiful! A belated Happy GBBD to you! your garden is so lovely at this time of year especially. the irises certainly are loving this very wet cool spring we are having as well as the lettuces. did you make it to grow wild's open house this year. dave and i made it and loved it. i bought a couple of spiderwort...i am so excited to add these beauties to my garden. we bought 7 trees from them as well...what a wonderful place to visit. Your GBBD offerings are gorgeous. I am all for natives when the opportunity presents itself, but when it comes to Iris, I prefer my Germans, hands down. I hope you have a great week. What a pretty bloom day you've shared with us, Gail... wonder if the monarda from the Lurie would grow on this side of the Mississippi? Your natives are beautiful, but I must confess the non-native noid Peony & black Iris are the ones I covet most! Was going to ask why the header says JUNE bloom day - now see Lisa already asked you. Am I missing a joke or something? Gorgeous blooms! Spectacular photography! You feed my plant lust. I, too, am enamored by the deep purple iris. What a gorgeous Bloom Day post Gail. I love your I. germanica. Your pictures are just fantastic. Despite the rain, your blooms are gorgeous! I'm still being "blessed" by rain here, and I'm trying to remain grateful, but sheesh! A little sun wouldn't hurt. Lovely post! Glad I visited! Oh Gail! Your wild and wondrous garden/landscape is utter magic. I love your new native Monarda and how great that you found further north. As always. . . the light in your photography is delicious and your menu and rustic open sign are so inviting. I am gathering you open your garden and what an inspiration it must be to all those who visit. But I'm always intrigued by flowers with veining/striping/patterns. I could stare at the blue flag iris for hours, and I love the spots on the monarda.